Chapter 12: Post Party Chill… or that was the plan! After the excitement of the party, we thought the pace of our time in Oz might slow down…. But we were wrong! Mum and Dad were still around until the Thursday and the six of us spent many a happy hour together. It is rare that we get time to spend with both sets of parents, at the same time and we really enjoyed the opportunity that this presented. 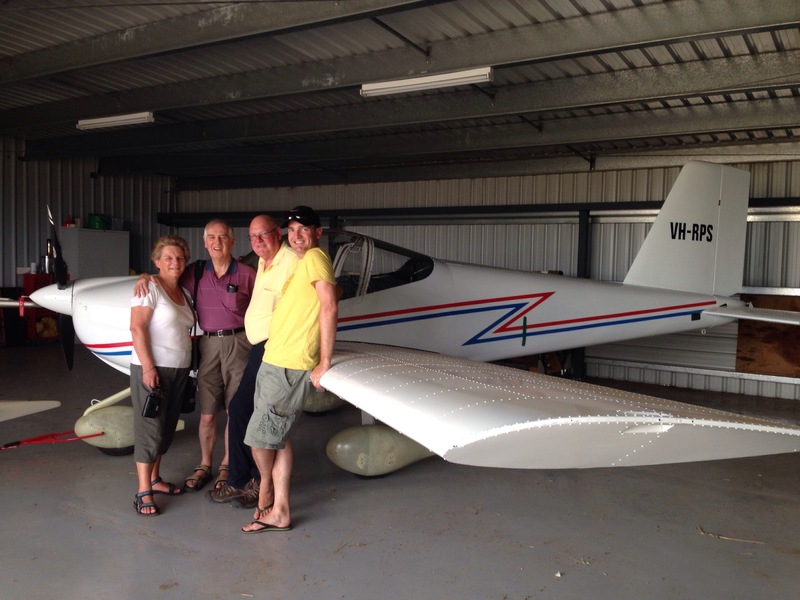 Ray took Mum and Dad out to see his plane. It was a shame that the weather wasn’t good enough to go up in it, but Dean and I were lucky enough to return with him later on it the week to do a couple of laps (not to be confused with loop-the-loops!). 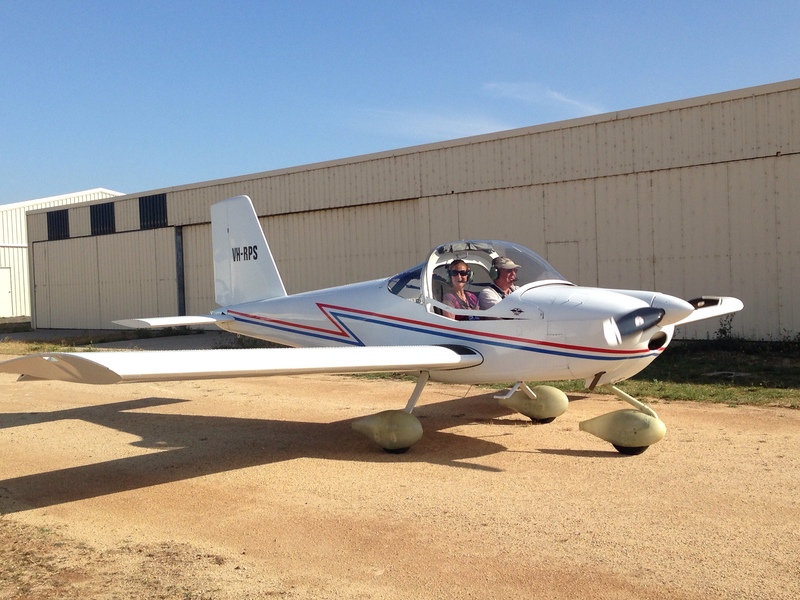 We are both so proud of Ray’s efforts in building the plane (yes you read that right) and I was proud to be the first female to fly in the plane! Mum and Dad will just have to come back and have a go next time! We then went out for lunch to celebrate Ray’s birthday and it was lovely to be back for that. Just before the wedding party I had taken Mum and Dad along the Great Ocean Road again, but we’d rather rushed bits of it so we went back and made several stops between Torquay and Apollo Bay. 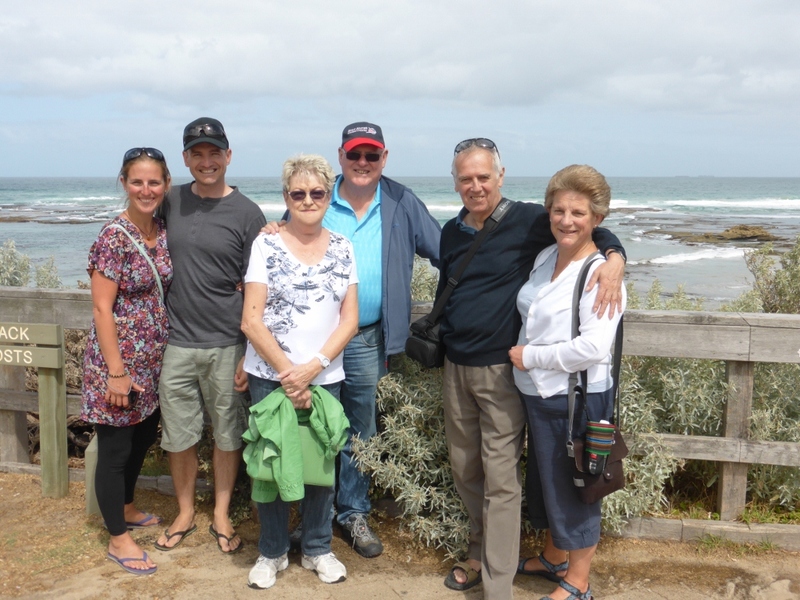 For me I love Airey’s Inlet and it is a real must see stop. We dipped our toes in the water at Anglesea – such a beautiful beach. 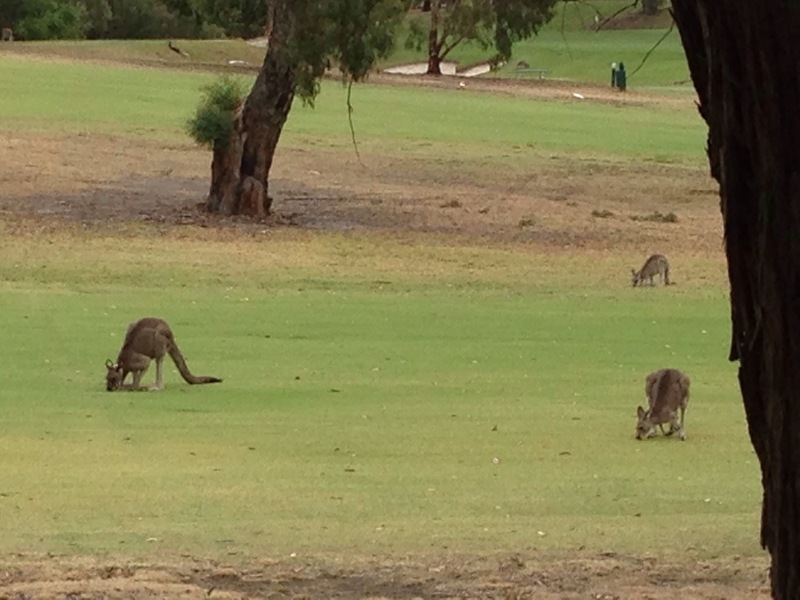 On the way back many a photo was taken of the wild Kangaroos on the Anglesea Golf Course! 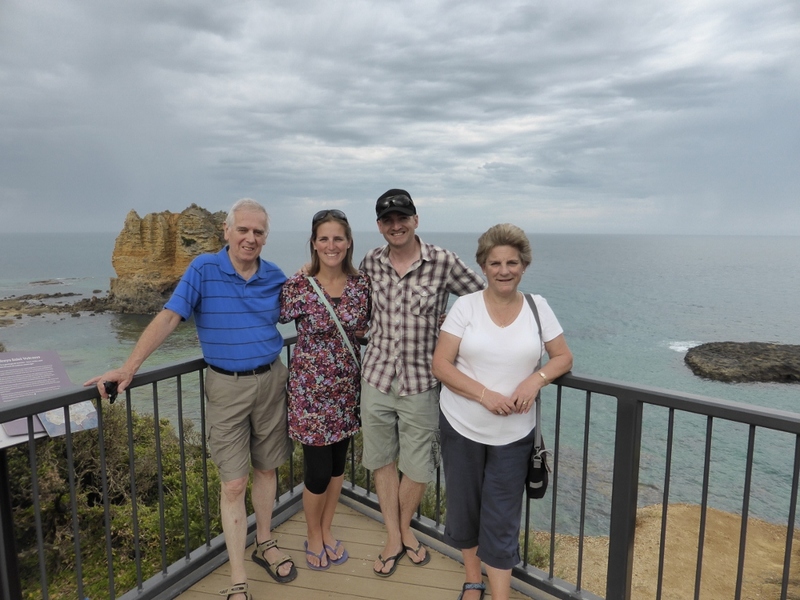 The last day was spent taking the ferry from Queenscliffe to Sorrento on the Mornington Peninsula. It’s a great ride and the sun came out to play. We all stopped at the amazing Mubble Ice cream (Owned by Dean’s Cousin) and sampled some of their finest flavours. One of the six of us liked it so much they went back for seconds… but they will remain nameless! The back beach there was as speculator as ever and we really had a lovely day. Another great photo thanks to yet another passer by! Dean will tell you all about the Grand Prix separately, but we enjoyed the rest of our week and we were so sad to be leaving. In hindsight two weeks was never going to be long enough in Australia and we said our goodbyes vowing to come for longer next time. 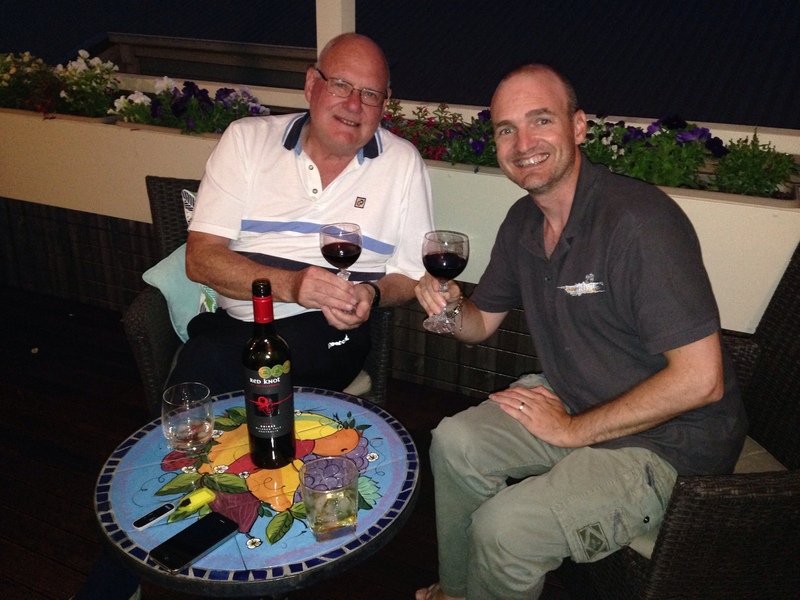 Boy time on our last night… Maree and I left them to it! Australia you truly are my second home and never fail to disappoint. It was a wonderful visit, and we can’t wait until next time! This entry was posted in Australia and tagged #loveoz, Mornington Penninsula, Mubble Ice Cream Sorrento, Queenscliffe ferry, Sorrento, The Great Ocean Road, The Smart Way Round.